Merkel Hopes To Dissuade Obama From Arming Ukraine : The Two-Way The German chancellor and her French counterpart, Francois Hollande, want to keep Washington from arming the rebels as part of a peace deal they are trying to forge. Ukrainian President Petro Poroshenko, left, German Chancellor Angela Merkel and U.S. Vice President Joe Biden, background right, arrive for a meeting in Munich, Germany on Saturday. The issue is this: Should the West arm Kiev against Russian-backed separatists in eastern Ukraine? German Chancellor Angela Merkel says no, and she is joined by French President Francois Hollande. They have the outline of a plan that Hollande says includes "rather strong" autonomy for Ukraine's east. And they are taking it to President Obama. As for the U.S., White House press secretary Josh Earnest says this: "The president is going to make a decision that he believes is in the broader national security interests of the United States," adding, "and part of that is understanding what sort of impact the decisions that we make have on our allies." NATO's top military commander, U.S. Air Force Gen. Philip Breedlove has made it clear that Washington has not ruled-out the option to arm Kiev. "I don't think we should preclude out of hand the possibility of the military option," Breedlove told reporters, according to Reuters. He clarified that he was talking about weapons and capabilities, not "boots on the ground." Reuters says it's part of an "emerging rift between America and Europe on over how to confront [Russian President Vladimir] Putin as the Moscow-backed rebels gain territory." Obama has been under increasing pressure at home to provide weapons to Kiev to bolster its ability to defeat the rebels. The Franco-German peace plan is being described as a last-ditch effort to forestall a broader conflict. Merkel and Hollande are hoping the U.S. will sign on. 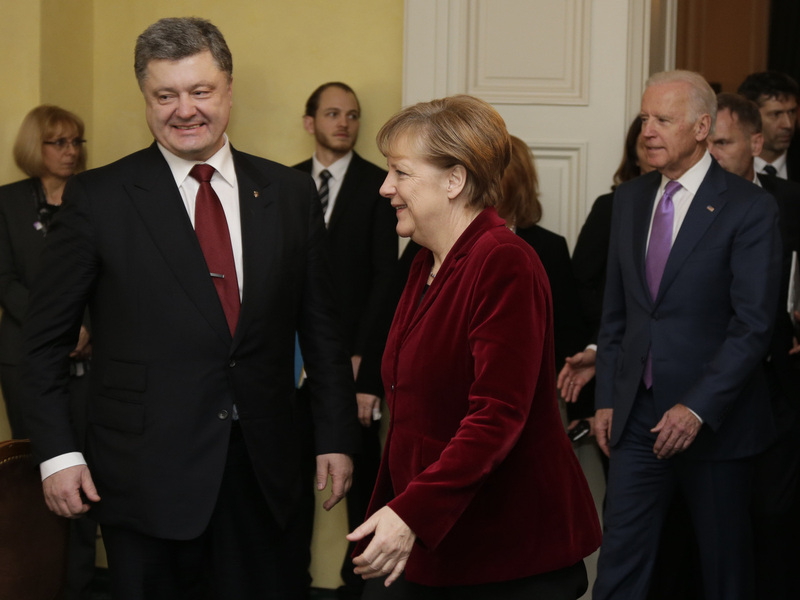 To that end, Merkel, who met today in Munich with Vice President Joe Biden and Ukrainian President Petro Poroshenko, will be in Washington on Sunday to make her case at the White House. In remarks in Munich, Biden warned Putin "to understand that, as he has changed, so has our focus. "We have moved from resetting this important relationship to reasserting the fundamental bedrock principles on which European freedom and stability rest," Biden said. "And I'll say it again: inviolate borders, no spheres of influence, the sovereign right to choose your own alliances." Even so, the German chancellor has expressed caution over the peace plan's chances of success and Hollande sounded a note of desperation, telling reporters in France: "If we don't manage to find not just a compromise but a lasting peace agreement, we know perfectly well what the scenario will be. It has a name, it's called war." Meanwhile, Russian Foreign Minister Sergei Lavrov is sounding a more optimistic note even as he issued a strong warning against arming Kiev, according to Reuters. "We believe that there are good grounds for optimism, to issue recommendations for conflict resolution," Lavrov said after talks on Friday. However, speaking at a debate in Munich today, Lavrov pointed to growing calls in the West to "pump Ukraine full of lethal weapons," Reuters says. "This position will only exacerbate the tragedy of Ukraine," he said.